Online banking is becoming a very popular way to satisfy our banking needs and this even includes people with no or very little technical background. There are numerous advantages when doing banking transactions online, such as 24/7 bank opening hours, ability to make transactions from anywhere in the world and convenience. The only problem is that we do not take our secured home PC everywhere with us. Consequently, the use of other computer and operating system rather than our own for online banking may involve a great security risk. However, what we can and usually carry on us everywhere we go is some sort of the USB key storage device. This article describes a way of building our own customized Online banking USB live Desktop. Solution to online banking by having an USB key with some bootable Live Linux distribution solely dedicated to serve our online banking needs can be very handy not even when traveling, but also when used on day to day basis. Usually, computers are shared among colleges, family members or friends and therefore chances are very high that our personal details will be made available to some fraudsters and their sophisticated scams and software. What is more, encrypting our non-persistent USB key will make Live USB online banking desktop worthless when falling into enemy hands. 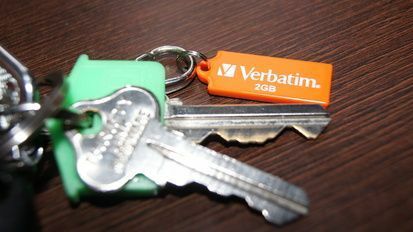 Therefore, there is no harm of storing our online passwords directly on the USB itself using an application such as gorilla-password ( double encryption ). Perhaps the outcome of this guide is not as good as the famous IronKey with all its shiny features, but we would all missed the fun if there will be no space to improve it. The software prerequisites are very simple and straight forward. All what is needed is a running Debian or Ubuntu desktop with live-helper and qemu packages. live-helper will take care of the live USB image build and qemu will be used for a customization of USB online banking desktop. mbr will be used to install a master boot record on USB memory drive. The simplest way to build a Debian USB linux live image is to use live-magic application which guides a user with entire process using a number of GUI dialogs. However, using this approach we will lose entire control of what is happening on the background and customization of the final product will be much harder. Instead, we will stick to a command line and use live-helper directly. The package-list you have chosen previously may not include all software you wish to be installed on you USB live stick and therefore next step is choose additional packages. Not all programs we wish to install are in the standard Debian repository and therefore live-helper gives as an option to include these programs in form of *.deb packages. As an example we may wish to install Google Chrome or Adobe flash player. Before your proceed download all packages you require into your home directory. This is just an example on how to include additional packages. Remember that including non-free packages carries its own risk and thus it may render your secure environment insecure. Ubuntu users may not have lh_* commands available. So instead lh_config use "lh config" and so on. would store user.tar.gz file locally inside our host's home directory. Encryption is optional. I only comes handy if our USB stick gets missing from some unforeseen reasons. This time do not run away while you are building your LIVE image, because you will be prompted to enter a pass phrase with at least 20 characters. So while live-helper is working use this time to think about something secure and what you can remember. After successful build you will have a binary.img file ready in your current working directory. My installation took around 450MB, so do not forget to claim your unused USB memory space with parted command. All should be ready to boot your USB live online banking desktop. Change your BIOS boot settings to USB drive and enjoy. Bootable USB LIVE stick can be very handy and easy to use on any computer with ability to boot from USB device. There are practically no disadvantages except when storing Online Banking passwords inside the USB LIVE image, as the image needs to be rebuild when passwords will change. Since the USB LIVE is locked behind encryption with minimum 20 characters pass phrase the chance that someone get an access to our passwords is close to 0. non-persistent mode ensures that it is impossible to store any sort of spyware for longer period than a single session. Yet, there is a plenty of space for improvement firewall, boot splash and etc.